The Settings Standings tab provides formatting options for the standings tables [shortcode]. The primary data fields and functions are described below, and annotated on the following screenshot. General Settings. 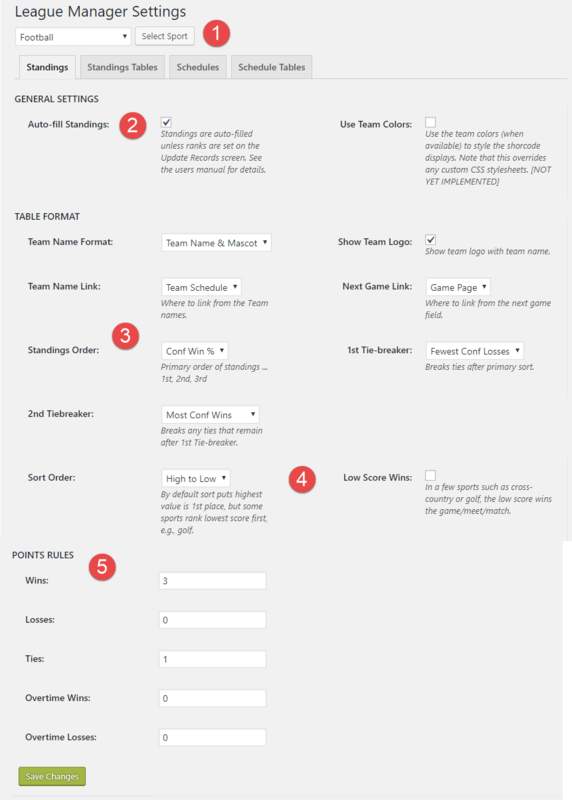 Specify how the team names, logos, and locations are displayed. Table Format – Standings Order. Select how the standings table for the sport should be ordered. This is how the teams are ranked in the standings (not to be confused with Sort Order below). Currently Rank, Points, and Win Percentage are available. Standings can be ordered in any custom manner using “Rank”, and perhaps not displaying it. For example, baseball standings and show a “Games Behind” column, update the the Rank for the teams to match Games Behind, order by “Rank”, and do not display the “Rank” column. Other order rules may be added in future releases, as well as a secondary order for breaking ties. Table Format – Sort Order & Low Score. Specify how the team names, logos, and locations are displayed. Points Rules. Use these fields to specify how points are calculated. They are irrelevant if points are not being displayed, and standings are not ordered by points. See Calculating Points and Calculating Win Percentage for more information on ordering standings tables.